There must be an economic or design justification for an owner to consider the use of the high-strength concrete for bridge girders. Similarly, there must be an economic justification for an owner to select HPC for a bridge deck. Usually, this justification is a longer service life. 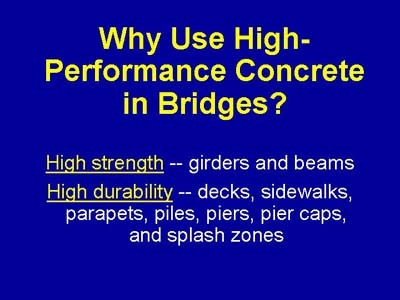 High strength will usually not be a design advantage in a bridge deck. Justification for use in bridge decks must be based upon improvements in durability brought about by reduced chloride intrusion. There are growing concerns over thermally-induced cracking resulting from the very high cement contents used to produce high-strength bridge girders. Combinations of portland cement, fly ash, and silica fume may allow achieving the strength required while reducing the heat generated during hydration. There is also a concern about the higher modulus of elasticity and lower creep of high-strength concrete in decks. Are these decks more prone to shrinkage cracking than low-strength concrete?